Dripping with luxury, the Venus is a sight to behold. 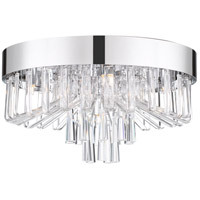 A polished chrome base is the perfect backdrop for the tiers of elongated glass drops, which arc toward the center, finishing in a cascade of prismatic perfection. This collection is a dazzling addition to Platinum by Quoizel.